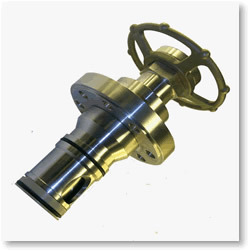 801 Stop Valve Cartridge Utilizing the oblique pattern principle, this valve has flow characteristics equivalent to those of full bore valves, but retains the sealing qualities of conventional globe valves. Available in 6 different sizes ranging from DN 6 to 50 (1\4" to 2").Low hand wheel torque is ensured throughout the whole pressure range by the use of balanced stem technology. Operating pressures range from 0 to 400 barG (0 to 6000 psi).